Silver Lake... Sand Dunes And More! Have you heard about the dunes? There are multiple places in Michigan to experience huge and amazing sand dunes, and Silver Lake is one of the places. Todd and I have been to the sand dunes around Traverse City and we wondered how the Silver Lake sand dunes would compare. We heard that we could also drive a Jeeps on these sand dunes… sounds crazy but true! So how was Silver Lake? Super cool with a great vibe and the dunes are awesome! We headed north from Covert about 2 hours and arrived at the Silver Lake Resort and Campground in Mears, MI. We got the recommendation from a friend and loved Silver Lake Resort and Campground! Silver Lake Resort and Campground is spacious, VERY clean, has the best showers we’ve had yet, has a nice pool, and the campground store and staff are great! Also, the campground is the closest to the ORV (“Off Road Vehicle”) entrance to the dunes… a plus for anyone driving their vehicle or ATV on the dunes. We had planned to take some time to visit Luddington to the north and Muskegon and Grand Haven to the south, but loved Silver Lake so much that we didn’t leave! Silver Lake has a really laid back vibe and lots of fun things to do… exploring the dunes on foot or in a vehicle, a couple fun parks (go carts, mini-golf, etc. ), a nice public beach, and access to Silver Lake and Lake Michigan (there are lots of places rent boats, kayaks, paddle boards, etc.). Our first day we explored the dunes by foot and the surrounding area. 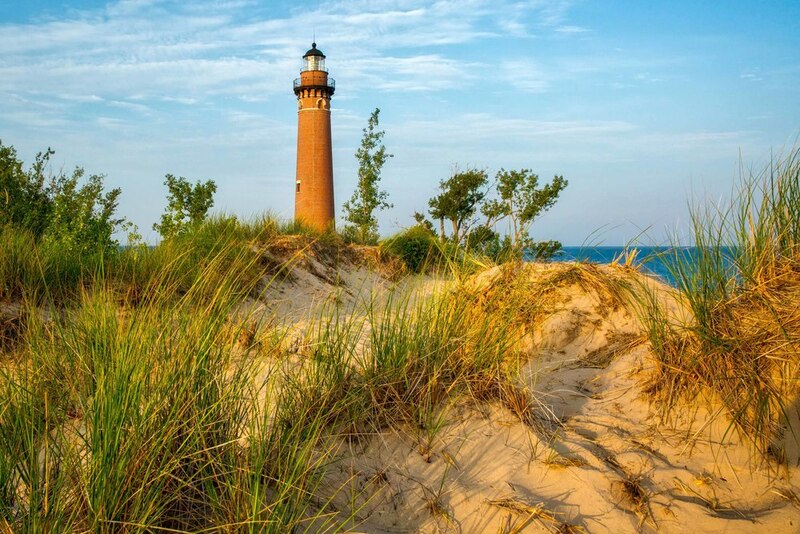 There are three general areas to check out… the town of Silver Lake, the public beach on Lake Michigan and the Little Sable lighthouse, and the sand dunes. The town of Silver Lake has a pedestrian/bike path and there’s a quiet street on the lake shore that’s great for running, walking, and biking. There are a number of restaurants and snack shacks in town. There’s a general store, but if you’re looking for produce and meat this is not the spot… there are some grocery stores in neighboring towns that are better options (and are not far). Most of the ATV, Jeep, kayak, and boat rental places are in town. The dunes are separated into three parts… Mac Wood’s (one of the tour companies) area, pedestrian area, and ORV area. We had a Jeep tour planned for the second day of our visit, so the first day we went to the pedestrian area. We headed north on the road around Silver Lake which led right to the pedestrian area parking lot. We weren’t sure what to expect… Todd and I were having not so great flashbacks of a very long walk years ago on the dunes by Traverse City where we walked for over an hour before seeing the lake! 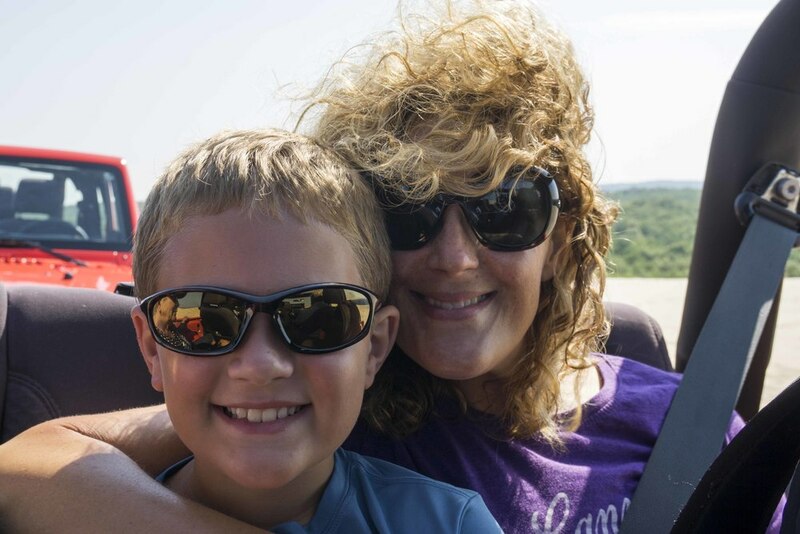 We had a much better experience on the Silver Lake sand dunes! From the parking area there is a set of stairs that lead to the dunes. The sand at the very beginning is really loose and hard to walk on, however once you get to the top the sand is much firmer. At the top we found both great views of Lake Michigan and great views of the ORV area. We walked around the dunes and watched people on dirt bikes and ATVs riding on the dunes. An item to note… we recommend bringing shoes (flip-flops are fine)… we found that the sand in some areas is very hot. After our sand dune walk we headed to Lake Michigan and the Little Sable lighthouse. We drove south on the road around Silver Lake to the parking area for the public beach. The lighthouse is a short walk down the road (there’s a parking area there too). The lighthouse is beautiful and Lake Michigan was especially clear and blue the day we were there. Our second day in Silver Lake we took to the dunes by Jeep. There are a number of rental and tour options available. We picked Parrot’s Landing by recommendation from a friend and also because we could drive the Jeep while on the tour. We chose the option to take an hour tour and have an hour in the Jeep to explore on our own. We had a great experience! The tour guide drives a Jeep and gives information and directions via the radio. While we enjoyed the time to explore on our own after the tour, we were very happy we took the tour first… there are lots of people on the sand dunes who go there a lot and understand the traffic patterns. It would have been really stressful to get out there not understanding the boundaries, how to drive in the sand, the areas to avoid, etc. Silver Lake and the surrounding area aren’t known for great restaurants, so we made most of our own food, including a great mixed grill with the meat we bought at Bob’s in South Haven. We did check out the Bucket Bar at the Golden Sands Golf Course, which is known for its herb crusted pizza. 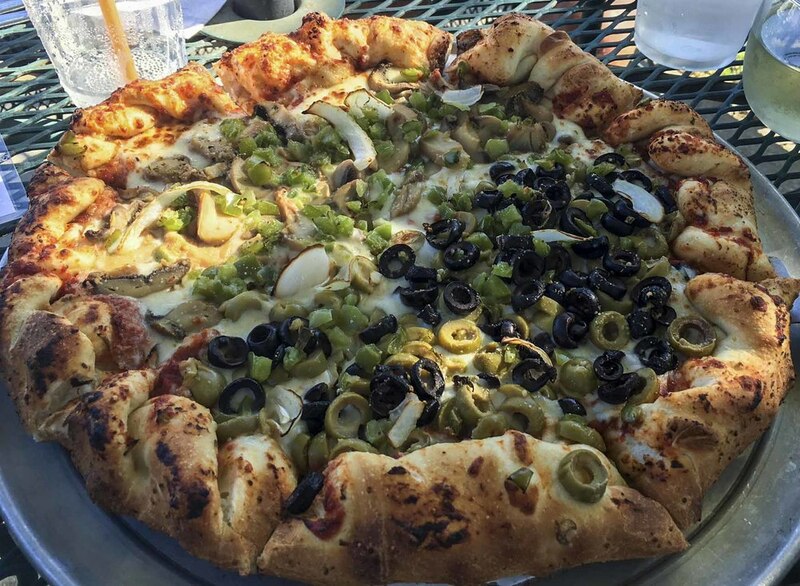 We LOVED it… not only was the pizza great, but the overall experience was fantastic… welcoming, relaxed, fun, etc. The Bucket Bar has a large patio looking out to the golf course and has games like corn hole, carpet pool, and bocce ball available. We enjoyed a drink while playing games and Daniel had a blast! So how about the food?? We had 3 different types of pizza which were all great. Three of us had dinner salads which were very fresh and tasty. The beer and wine lists are expansive and the Bucket Bar also has a full bar. The menu has a lot of options other than pizza… subs, wraps, and salads. The Bucket Bar serves burgers on Wednesday. Our conclusion… If you’re looking for a relaxed vibe with lots of fun things to do, Silver Lake is a great spot!